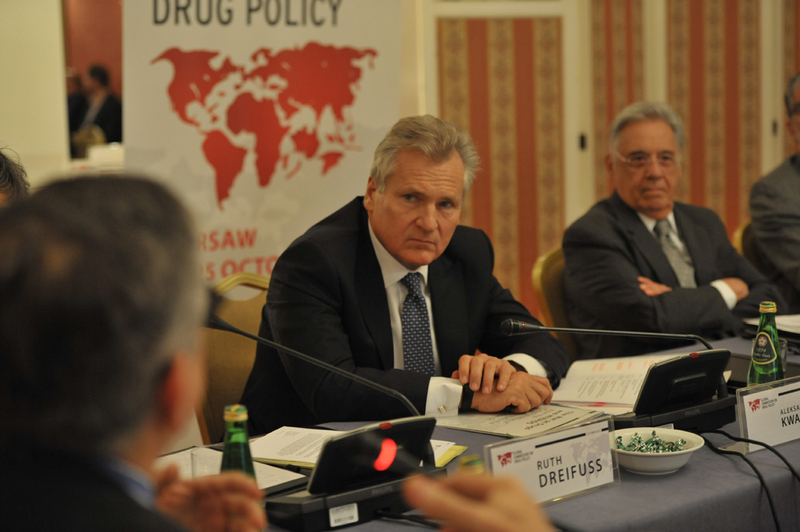 Warsaw, Poland – The Global Commission on Drug Policy (GDCP) is meeting today and tomorrow in Warsaw to highlight the impact of the war on drugs on public health in Eastern Europe and prospects for change around the world. Former Polish president and member of the GCDP, Alexander Kwasniewski, opened the conference highlighting the importance of bringing this debate not only to Poland but to influence Eastern Europe, a region where the drug issue is still a taboo with severe harms to public health. “It is a great honor for me to host such a renowned group of people. It is important to have the Global Commission’s meeting held in this part of the world where drug use and HIV are still not discussed adequately”, stated Alexander Kwasniewski. “We need to better understand the problem, get away from criminalization and repression and adopt a new approach, one which puts drug policy under the responsibility of the Ministers of Education and Health. It may take sometime, but only then we have a chance to change the situation”. Fernando Henrique Cardoso, former Brazilian president and chair of the GCDP, reinforced that “it is not by chance that we are gathering in Warsaw, as we want to expand our work beyond the Americas and Western Europe, outreaching to Eastern Europe, Asia and Africa”. Cardoso further stated “the GCDP is now in a much stronger position to have a positive influence on the UN system on drug policy issues, building upon the progress achieved over the past 15 months specially in Latin America”, a vision that was strongly supported by Cesar Gaviria, former president of Colombia also attending the meeting in Poland. As part of the agenda, members of the GCDP will meet with Polish president Bronisław Maria Komorowski and at the end of the day the will attend a roundtable organized by the Polish newspaper Gazeta Wyborcza to allow interaction with media and the public. The Global Commission was convened in July 2010 and has been working to establish a road map for change in drug laws and policies. It is currently composed of 22 international leaders, including seven former presidents. Bringing the debate to Eastern Europe means to focus on the dramatic human and social consequences of the prevailing hardline approach to drugs in the region. In addition to looking at the drug war’s impacts on the region, the agenda of the two-day meeting considers the dynamics of change in Latin America, the US and Europe, and how to go truly global. 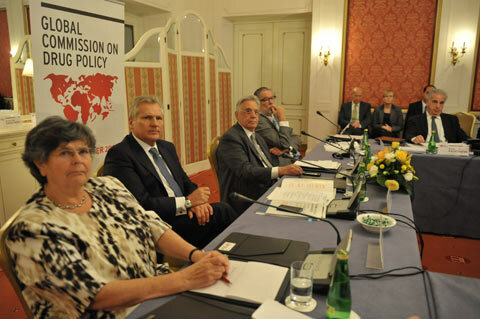 Discussions in Warsaw are building upon the Global Commission’s second report: ‘The War on Drugs and HIV/AIDS: how the criminalization of drug use fuels the global pandemic’, launched in June 2012. The report describes how the global war on drugs is driving the HIV pandemic among people who use drugs and their sexual partners. In Russia, for instance, one out of every one hundred adults is now living with HIV, according to some estimates, and injecting drug use accounts for the majority of new infections. Globally, drug use accounts for approximately 1/3 of new HIV infections outside of sub-Saharan Africa. Such linkages between drugs and HIV/AIDS and the engagement of the AIDS community are critical factors to promote this debate in Eastern Europe. – Encourage governments to experiment with models of legal regulation to undermine the power of organized crime and safeguard people’s health and security. Start with cannabis. This call for a paradigm shift – from compliance with a failed policy to open debate about viable alternatives, from prohibition to prevention, treatment and harm reduction – was reported widely by the global media, establishing the Commission’s reputation as a global catalyst for change. Over the last fifteen months, the Global Commission’s engagement with political leaders, media and the public has had a substantive impact in Latin America. The taboo was broken and policy alternatives were put on the table by the Presidents of Colombia, Guatemala and Uruguay. For the first time ever the issue of drugs was discussed at the Summit of the Americas held in Cartagena, Colombia, on April 2012, and there were initial signs of flexibility for debate coming from the Obama administration in the USA. Recently the Global Commission has been strengthened by the engagement of former presidents Jorge Sampaio (Portugal), Alexander Kwasniewski (Poland) and Ricardo Lagos (Chile). This expansion is essential to build the Commission’s capacity to meet the challenge of taking the debate about drugs beyond Europe and the Americas. See the list of commissioners.